Butter shortbread biscuits, citrus flavour. Free from GMOs and palm oil. Do not contain eggs. Made in France. 175g pack. This product can be kept for 12 months in a dry and cool place in it's original sealed packaging. Established for over 10 years in the Aveyron, the family business Le Moulin du Pivert is specialized in the manufacture of products issued only from Organic Agriculture. 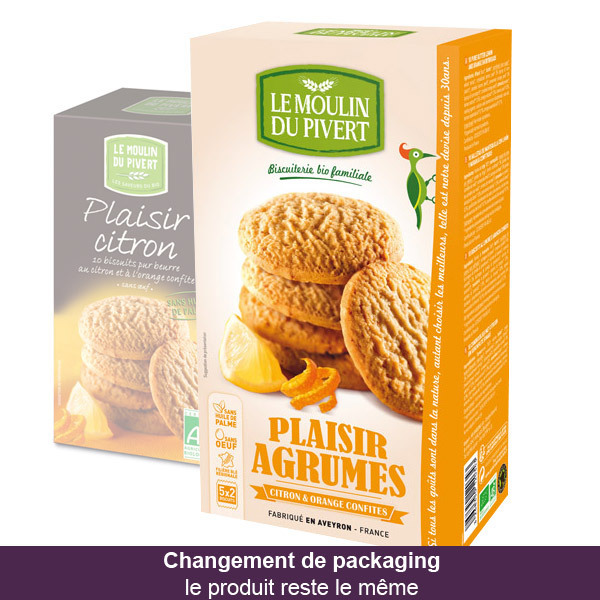 Le Moulin du Pivert factory makes organic cookies guaranteed without palm oil. The company supports small local organic farmers and uses ingredients from development programs and fair trade. Discover a complete range of 100% organic tasty and traditional cookie recipes , crackers, and other grilled chocolate cookies that the whole family will enjoy!